The Fed's mandates do not include preventing bear markets. Or even "short term response" to move the stock market. That's silly. So apparently our beloved central bank wants to turn into the PBOC. What could go wrong? So apparently our beloved central bank wants to turn into the PBOC. Well, Jerome changes his mind like a fart in the wind, almost as if he’s reacting to market behavior. Or, maybe he's just seeing a change in the data now from 2 months ago and he's reacting to the new information. I remember that Alan Greenspan once told congress, in a Humphrey-Hawkins semi-annual testimony, that the Fed has more financial and economic data at its disposal than any entity has ever had in all of history. And "it's not enough." And you know the Fed has way more data at its disposal today compared to Greenspan’s time. Time for the bears to call it off. Paul Krugman just said the US will endure a recession and that it is imminent. I am not sure there is a better contraindicator than him. Well unless Q4 GDP grew by 3.64% (annualized) over the third quarter, it won’t reach 2.95% to round up to 3.0% for the year. Although the difference between 2.90% and 2.95% significant isn’t enough to call it a good prediction for a non-hack, but in Krugman’s case, that’s about as impressive as it gets compared to his asinine predictions and failures in the past. You might need to check your math. From the latest spreadsheet that I downloaded from the BEA at Commerce, I calculate that only 2.2% annualized real GDP growth for the 4Q is required to achieve a 3.0% figure for all of 2018, assuming no other revisions of course. To get back on the subject of what's been driving the 4Q drops in the market (from 10/3/18 to 12/24/18) and the post-Christmas rally (from 12/24/18 to present), there have been a few interesting charts I've seen in recent days. What we've been hearing from a lot of bulls in the financial media is that the December selloff was caused by investors getting jittery over the federal government budget standoff and U.S.-China trade relations. But this story doesn't really make a lot of sense. The big story that gets less coverage is the recent consensus from EM investors that the Chinese markets have bottomed, and that PBoC stimulus was overwhelming and has already saved the day. I'm skeptical of that, but it's certainly been a huge factor so far in 2019. Additionally, of course, we have the loosening expectations on FRB monetary policy. Taken together, the PBoC and FRB have driven the post-Christmas rally. Note that corporate earnings projections have not driven the rally. As of a few days ago, S&P 500 operating earnings growth for the 2Q of 2019 have now dipped below inflation expectations. Wall Street is selling investors on the idea that earnings growth will return stronger in the 4Q, but those projections are already more than halfway to zero relative to where they were in early October 2018. And as I said for the alleged miracle rebound of the Chinese economy, I'm skeptical. 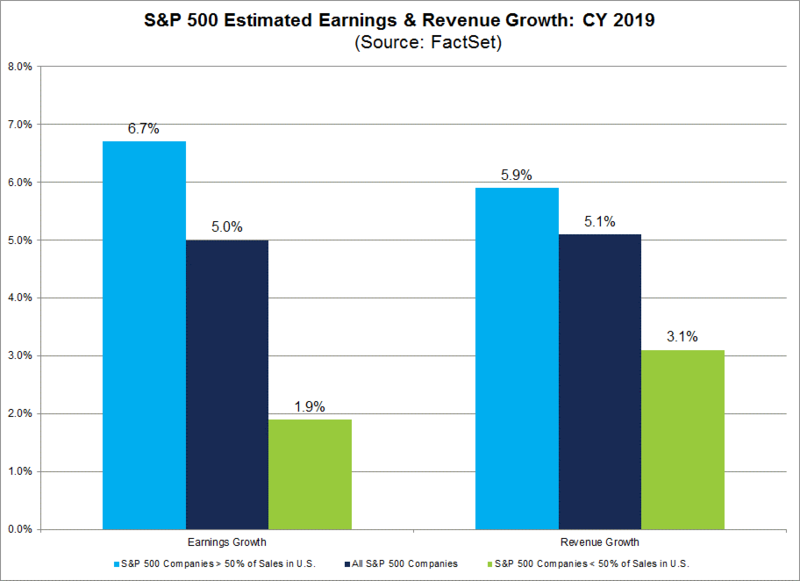 According to FactSet ( LINK), revenue growth projections for S&P 500 firms with over 50% of sales outside the U.S. aren't looking very healthy. Some of that is attributable to the current EU recession, but much of it (especially when it comes to corporations looking for high sales growth) is Chinese. Now I don't want to base too much of my analysis on China, because it's opaque, and because I don't ultimately know what's going to happen with U.S.-China trade negotiations (which seem to be getting suspended indefinitely in a lengthy state of limbo), and because I base my analysis mostly on domestic evidence. But the China narrative is essential to understanding the past two months, and I think most of it points to something happening that goes well beyond the current trade negotiations. Anyway, as of the close of trading today, we now stand 17.3% above the intraday bottom from Christmas Eve (just 51 days earlier), but we are also still 6.4% below the peak from late September. My bet is that we have still yet to see the majority of the fallout from continually falling corporate revenue projections, because that fallout has been delayed (but not eliminated) by central banks. The math is correct. I even downloaded to the data and double-checked it. The issue is that you’re calculating the geometric mean if the four quarters whereas the government calculates annual growth as the average (sum works too) of the real gdp for the four quarters of most recent year divided by the average of the four quarters of the previous year. thought they had some in it until an economist pointed out the offical method last which I verified using the BEA’s data. So using the government’s method though, would required a 3.64% growth. Well, hot damn. You are correct. I may have had a fleeting thought about this before, but I never really worked through the implications, because for some reason I assumed the difference would never be big enough to matter that much. But it really does if Q1 growth and Q4 growth from the previous year are slow. So using the government’s method though, would required a 3.64% growth. And that's only if you count rounding up. It gets a lot higher if you adhere to a strict >= 3.0% approach. I was wrong. Thanks for the explanation. Atlanta Fed just revised Q4 GDP growth -1% to 1.5% total. They are the Jim Cramer of Fed Banks. Not good for the bulls. I wonder if we can get pioneerbasketball from the SEC Rant to make us a Team Buybacks bunchie avatar.